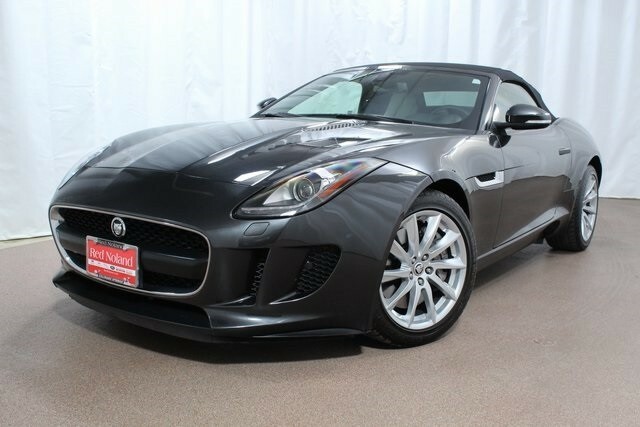 Jaguar Colorado Springs in Colorado Springs, Colorado currently has this gently used Approved Certified Preowned 2014 Jaguar F-TYPE Convertible in our inventory! This beautiful vehicle is a CARFAX one-owner convertible; perfect for the beautiful Colorado weather. It is equipped with a 3.0L V6 DOHC 24V Supercharged engine. This will get you an estimated 20 MPG city/28 MPG highway. The odometer reads less than 15,000 for mileage! If amazing features are important to you, this F-TYPE does not disappoint with its features such as leather seats, navigation system and Climate Package. Heated steering wheel, Meridian 380W Audio System w/10 Speakers, switchable active exhaust, and heated door mirrors are just some of the features. Stop into Jaguar Colorado Springs today to learn all about this exciting Jaguar F-TYPE Convertible. Our Jaguar experts can show you all the innovative features that will make each of your drives more enjoyable. We are located just off I-25 so we are convenient to Castle Rock, Monument, and Pueblo too!